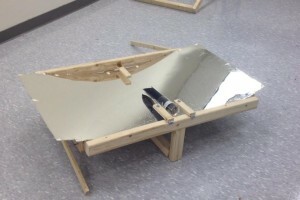 Since both teams could benefit from information regarding solar reflector performance, all tests were conducted and results shared by both teams. The tests alternated between using water and coconut husk inside the tube, depending on the resources available at the time. An important note is that all testing should be done with the proper safety equipment. The sheet will reflect very intense light from the sun, which is very dangerous to the eyes. Special goggles should be available for use–if they are not available, at least having sunglasses will be better than nothing. 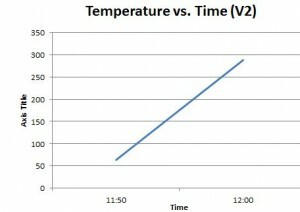 Temperature measurements were initially taken using a meat thermometer, but due to its sensing limitations the teams switched to an infrared laser thermometer. 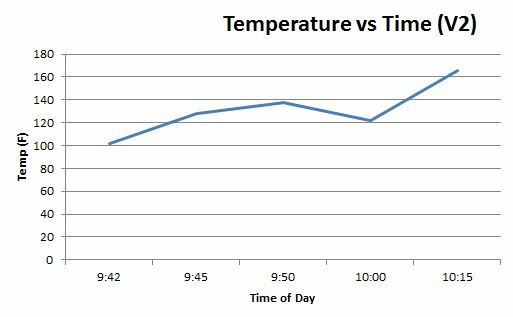 Eventually, even this reached its limits–it is recommended that if testing is expected to reach temperatures higher than 500 degrees F, a higher capacity thermometer should be used. 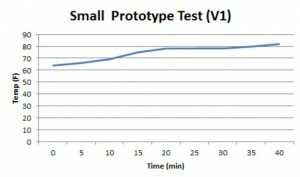 The first test was conducted with Prototype 1, mainly as a proof of concept. 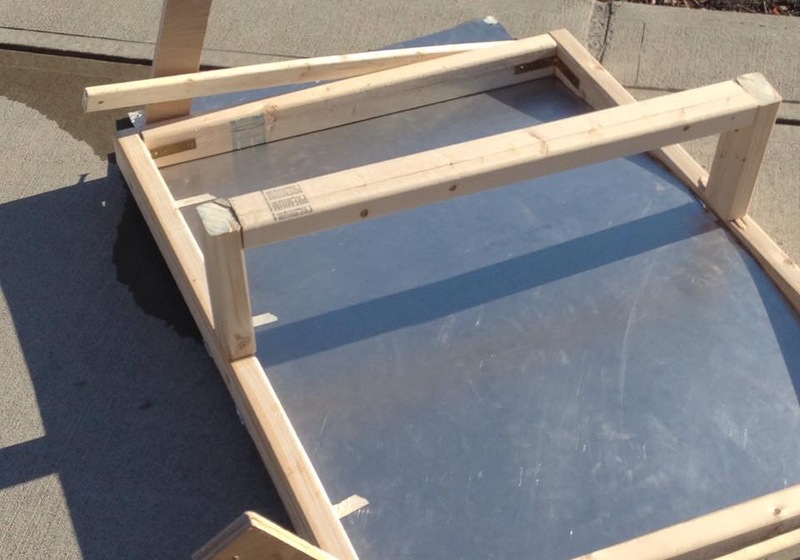 Mocking up a quick design out of cardboard, the solar collector tube was quickly tested to understand how it would behave. This test was completed on a sunny day with our first protype. 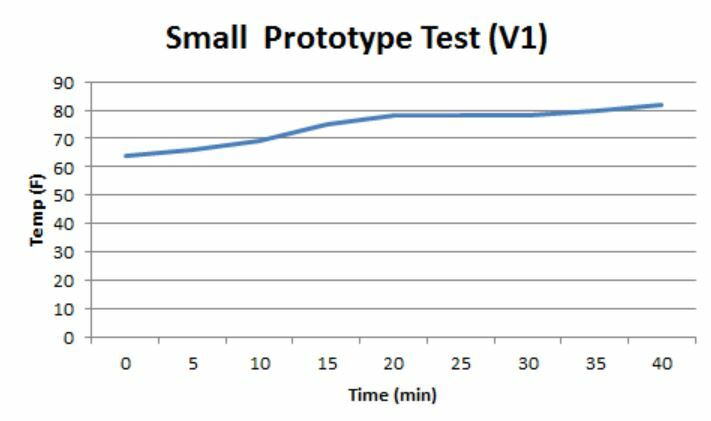 This was the first test conducted with Prototype 2. All measurements were taken using a meat thermometer inserted into a rubber stopper. Because the steam was escaping through the rubber stopper, the high temperature eventually melted the meat thermometer being used for measurements. 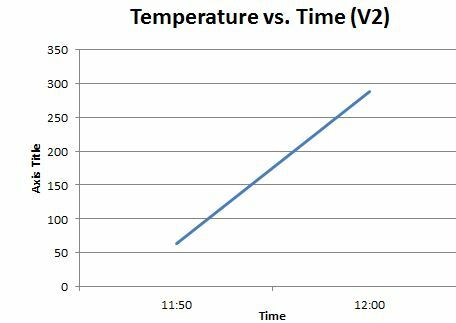 After that, it was decided that the test should continue running until all the water had evaporated to understand how long it would take. Also, only part way through testing, Public Safety approached the team and forced them out of the testing location–concluding testing earlier than anticipated. 3 12:15 48 too high 45 The thermometer melted. 4 12:30 48 >288 45 Water is evaporating. Test 4 was conducted using coconut husk for biochar. 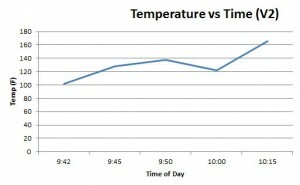 However, this test was cut short due to a sudden change in weather from sunny to cloudy. 5 10:15 71 166 – Measured after we went inside, using the ‘point-and-click’ thermometer. 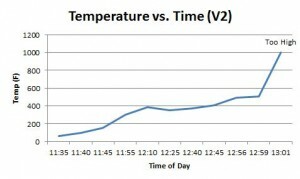 This test was again conducted using coconut husk for biochar and allowed to run to much higher temperatures than before, such that some form of pyrolysis could be achieved. 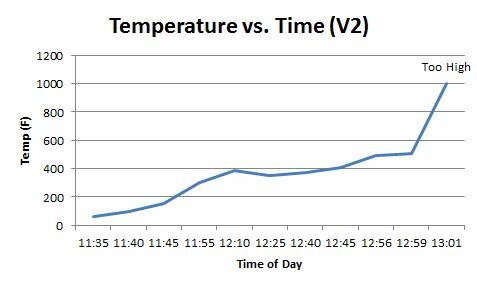 However, the intense heat caused the thermometer to eventually read “HH,” which indicates an excessively high temperature. 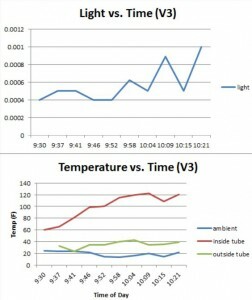 Also, the increasing amount of smoke escaping from the tube made it more and more difficult to take a reliable measurement. 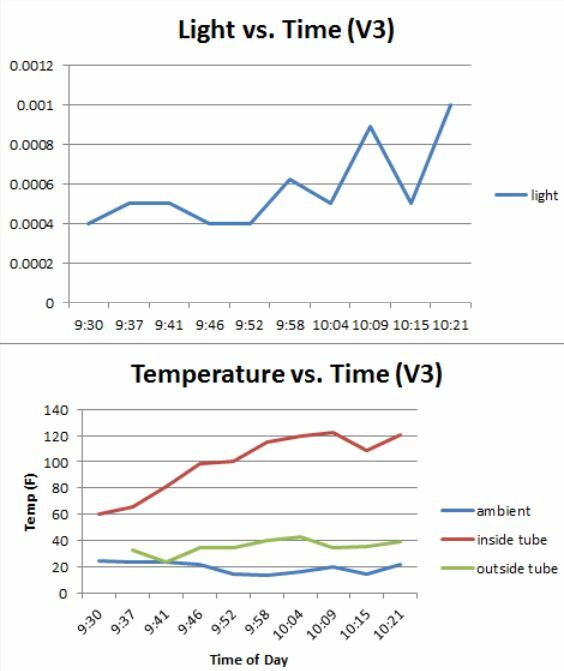 After testing, it was found that the intense heat coming from the tube was causing increasing damage to the thermometer again. 5 12:10 63 390 45 Severe smoke coming from the tube. 11 13:01 63 The thermometer is reaching HH (too high) 45 The gross amount of smoke made it hard to measure the actual temperature of the biomass (coconut shell), because the thermometer detected the smoke instead. This test was meant to be a last attempt at quantifying both the amount of water the reflector can boil, and measuring the setup’s biochar throughput. Due to adverse weather conditions during testing, however, the test reflector set up received heavy damage, shattering the solar collector tube. We did not consider wind as a factor upon building this prototype. The wait was heavily distributed towards the front of the prototype, causing it to be easily knocked over with a gust of wind during testing. We also did not consider the sturdiness of the back legs, which gave out beneath the prototype with the gust of wind. This caused us to redesign the legs to be much more sturdy. We also suggest using a bag of sand in future iterations to distribute weight properly. Image left: the crash of our prototype, falling forward on the pavement.